Here we have a freshly opened box of the Mines of Moria set for Lord of the Rings, which needs a quick paint before being loaned to our local stockist for display. 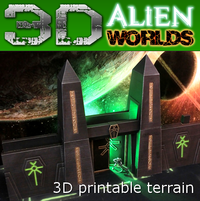 This would also be used in future games at demo events, so it needed to be quick and simple, but effective enough to give the right atmosphere. 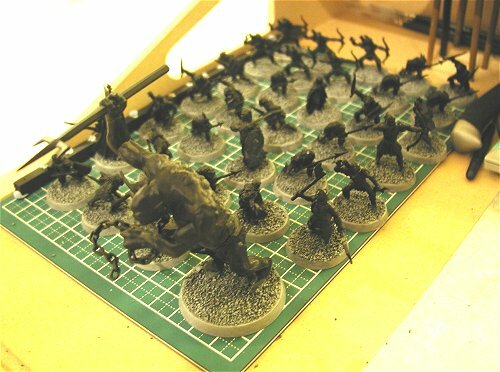 So over the course of about 2 weeks, roughly 2 hours each night was spent preparing and painting the terrain board, then the goblins, then the fellowship models. This is a quick account of how I did it. 1. 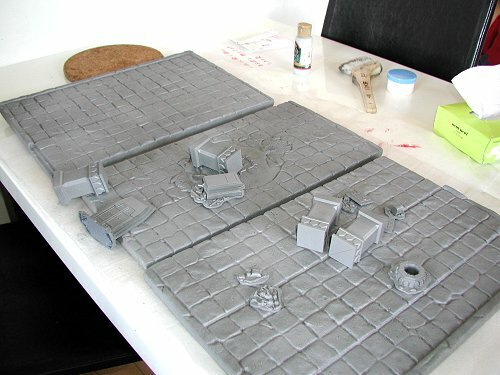 I happened to have an old textured Bloodbowl pitch lying around, which would make an excellent display board for the shop, so here's a photos of the assembled items ready for undercoating. All of the models have been glued into their bases, and a 50:50 mix of water and PVA glue painted onto the bases was follwed by a quick dip in a tub of modelling sand. 2. All terrain was undercoated with a medium-dark grey matt spray. Of course if you have polystyrene boards like the photo, you'll need to check that the spray is safe for them - or they will melt. Normally I would undercoat everything in black, but I wanted a slightly lighter feel for this demo board, so opted for grey. Having undercoated the boards and terrain, I found it still a little dark, so I sprayed a lighter medium grey over the top in patches too. 3. Leave it to dry overnight. The photo below shows the second, lighter shade of grey I used, which I think looked a little better. The patchiness also added a bit of variation. 4. I used a cheap acrylic paint from a local DIY store and a very large brush to quickly drybrush all the boards and terrain. This really was done very roughly, but produced a good extra layer of interest. 5. With the majority of the terrain finished, I quickly painted CALTHAN BROWN (foundation paint) over the wood areas, then CHAINMAIL over the metal areas of the doors, chests, hatches etc. 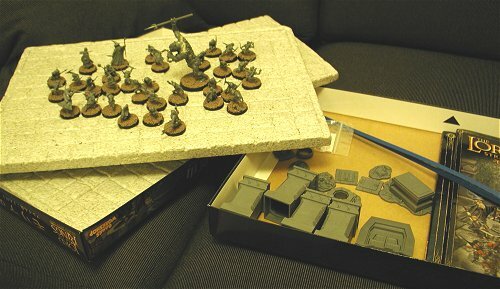 The other terrain models (bits of armour, books, skeletons etc) I painted roughly in a variety of foundation paints. Then I washed all the painted areas in BADAB BLACK. 1. 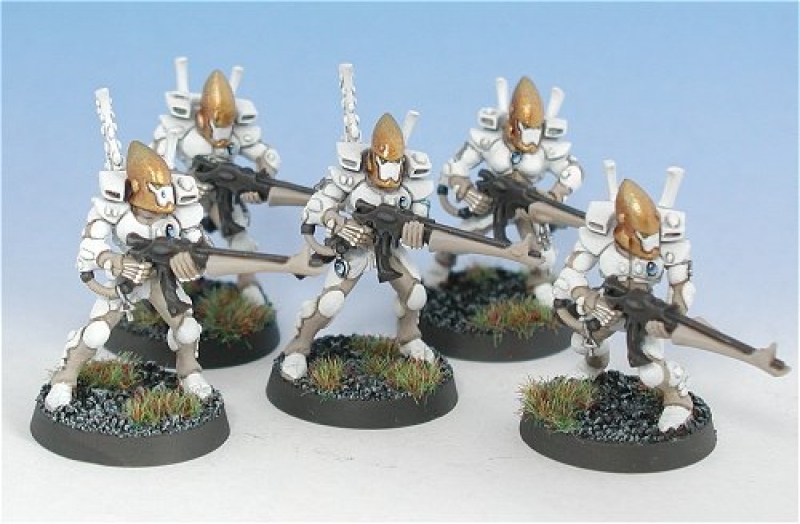 As I said before, all the models were given textured bases using glue and sand. Then they were quickly undercoated with a matt black spray. 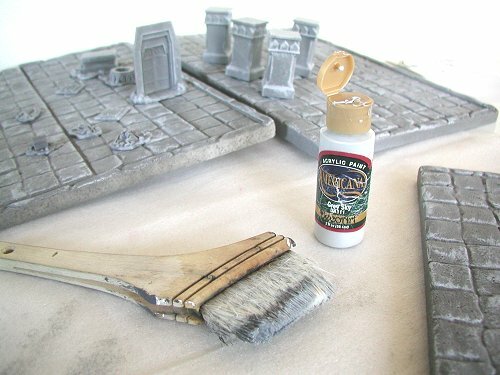 When dry, I use a half-inch brush to roughly drybrush the bases in a medium grey colour (I used some old wall paint I found lying around), and then again in a lighter grey acrylic (same one I used for the terrain). 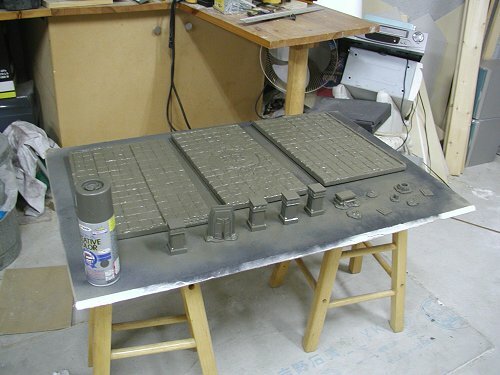 Finally, a neat paint of the side of the base, and they are ready for painting. I always do the bases first these days because A) it's boring, and I want to move on, and B) you risk getting mucky fingerprints on your paint jobs if you do it later. 3. I drybrushed all metallic areas with CHAINMAIL with a fairly large and battered brush. Good to do this first, as subsequent coats of paint will hide the mess on other areas. 5. All wooden areas (bows, spear shafts etc) and leather straps were given a coat of SCORCHED BROWN, and skins area were then painted in GRETCHIN GREEN. The whole model was then liberally washed in DEVLAN MUD with a large brush. Once dry, the eyes were dabbed with yellow, and any teeth with DHENEB STONE. Love these foundation paints! 1. 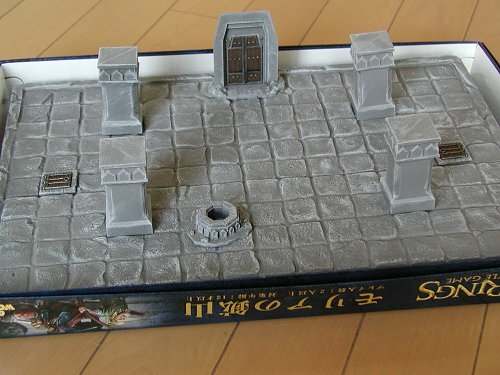 The last elements of the box set were the nine models making up the famous fellowship. The early stages were done in much the same way as the goblins, but I spent a little extra time highlighting clothes and skin. 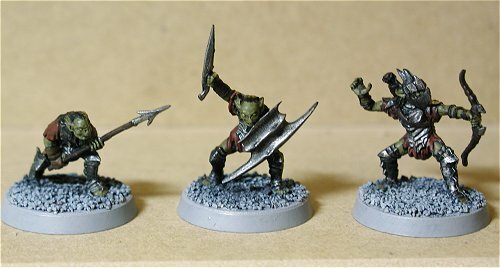 I painted all the models' areas in various foundation paints colours, including TALLARN FLESH for the hobbits' feet. I left the hands, faces and hair mostly unpainted (except dark brown hair for Aragorn, Boromir and Gimli) for now. However, I did do Gandalf's beard in ASTRONOMICAN GREY, because I know this works well with washes. 2. 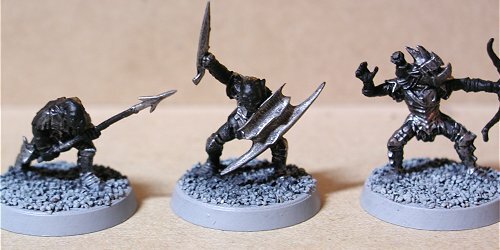 I applied a fairly heavy black wash with a large brush over all models with BADAB BLACK. The shiny effect would be removed later with varnishing. 3. TALLARN FLESH was applied to all skin areas, and then the models would be ready for highlighting. You could, of course, use the models at this stage (if you paint Legolas' hair), but I had a couple days left in my schedule. 4. Final highlighting was done with lighter shades of each colour, and ELF FLESH was used for the majority of skin highlights. Legolas' skin needed to be a little fairer (to match the hair), so I used thin highlights of BLEACHED BONE too. The skin probably took the longest of all on these models, and making sure that the eyes weren't too goggley (but of course you can't see that in this photo)! 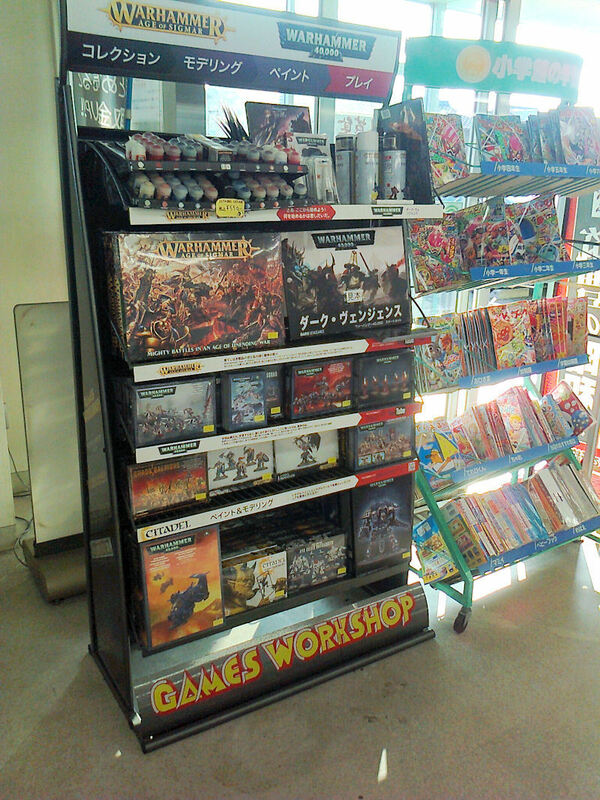 The set is now on display at the Stage 1 store in Moji, if anybody wants to take a look!